Begin by placing everything apart from the oats and chocolate in a large pan and letting the butter melt. Meanwhile, line a swiss roll tin with baking paper. Once the butter et al is melted, add the oats and mix well. Press into the lined tin and bake in a moderate (180 degree) oven for 15-20 mins until bubbling and golden brown. Take care not to overbake or the edges and sides will become brittle and too crunchy when it’s cooled. Remove from the oven once cooked and leave to cool for 30 mins or so before sliding out of the tin. Leave on the baking paper to cool totally. Drizzle/spread over the melted chocolate in any pattern you like and then cut into bars once the chocolate has set. Deeeelishous!!! I want to ensure that my vegan friends, and those who suffer from lactose/dairy intolerances, can join in the baking fun. 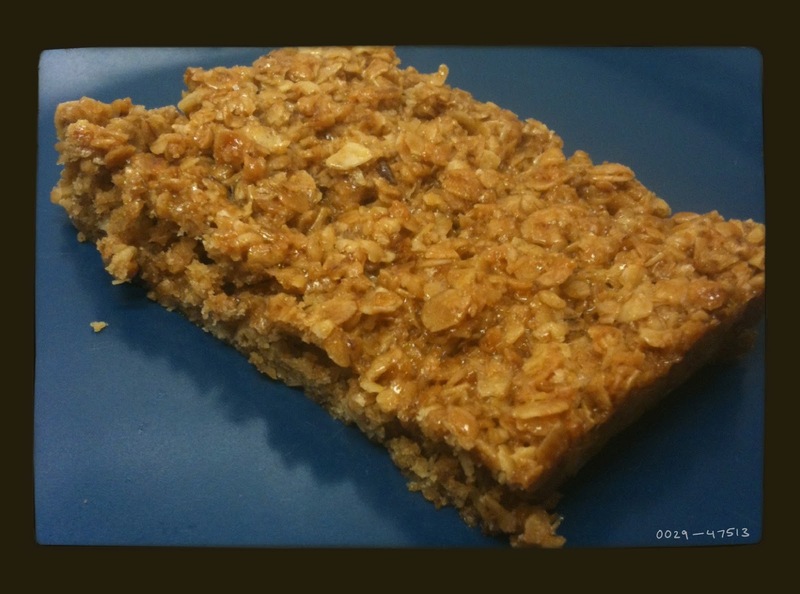 So I have adapted my usual veggie flapjack recipe to a vegan version and road tested it today. I am pleased to report that it works. Really well. In fact I think I will ditch the butter version as this one is so good! This is my mum’s recipe and is so simple but makes a really tasty loaf that keeps well and also toasts well. Place the yeast and sugar in a jug with 350ml warm water. Leave for a few moments till it goes frothy. Meanwhile place everything else in a bowl and mix. Add the yeasted water and mix to a dough, adding more water if necessary. Turn out and knead for about 10 mins till elastic. Leave to rise for 60-90 mins then knock back. Shape into a circle and place on a baking sheet. Cook in a hot oven for about 40 mins. This is based on Jamie’s recipe and is a good quick midweek pudding to fortify the soul and ward off against the cold winter horribleness. Stew the apples till soft (takes about 15 mins). Blitz the margarine with the flour and sugar and then mix through the oats. Place the apples in an ovenproof dish and top with the crumble mix. Bake for 20-30 mins and serve with vegan custard. Place everything in a pan over a gentle heat and stir till thickened. Eat. Fill fortified. Melt the sugar, butter and syrup in a pan. 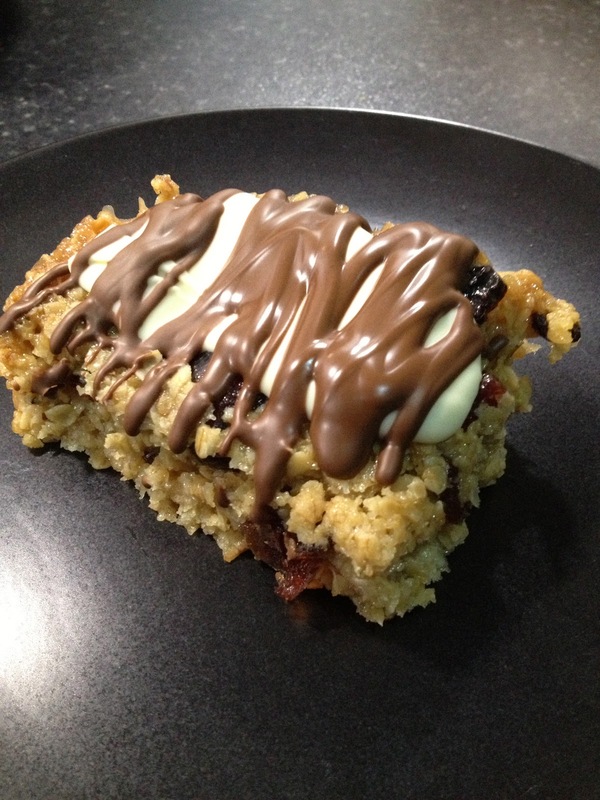 Once melted add the oats and the chocolate. Press in to a lined swiss roll tin and bake at 160 degrees for 15 mins. Leave to cool then cut and scoff. 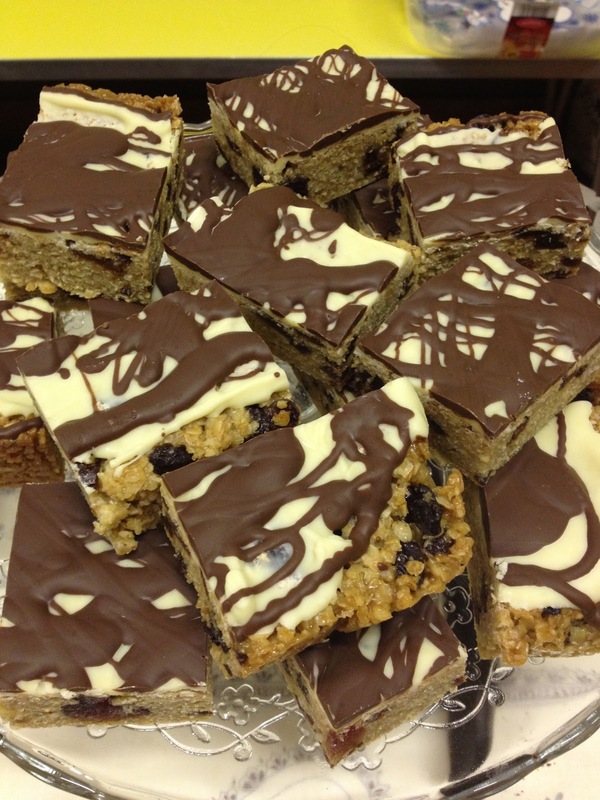 I wonder whether prodding the chocolate on to the top of the flapjacks would be more successful? Anyone any tips?! This is a River Cottage recipe which we all saw being made earlier today. Lex was inspired by the recipe so we all made them and scoffed them. I would never have thought to add lemon and orange zest to the mix but it adds a lovely, zingy fresh taste. Yum. The original recipe is on the river cottage website. Melt together everything bar the oats, fruit and seeds. Mix the wet into the oats and fruit and 2/3 of the seeds. Pour into a lined 20cm square tin and press down. Scatter over the remaining seeds and drizzle with a little more honey. Bake in a moderate oven for 30 mins. Leave to cool before cutting in to bars and scoffing. Deeeeeelicious! A storecupboard staple and a snack that’s easily knocked up in 15 mins or so. Melt the butter, sugar and syrup; then add the oats and pack into a lined baking tin. Bake at 160 for 10 mins, leave to cool, cut in to squares and scoff. Wonder why you’ve got that fat!